Stream House Bed & Breakfast Rye provides 5-star luxury accommodation in the Rye and Hastings area. Guests Lounge at Stream House Bed and Breakfast Rye – relax and unwind. Enjoy breakfast in our sunny dining room. Complimentary tea will be served in the lounge or garden upon arrival at Stream House Bed and Breakfast Rye. 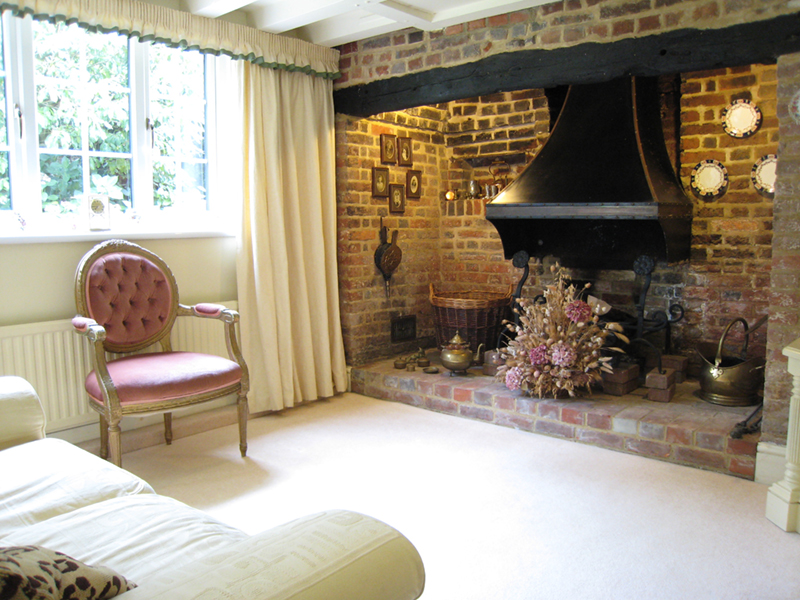 Relax by the inglenook fireplace with log fires in winter where you can completely unwind. Sit back and enjoy the delights of Stream House Bed and Breakfast Rye with all its charm and character. Enjoy breakfast in our sunny dining room overlooking the stream. In addition to a generous cooked breakfast you can enjoy a choice of cereals, muesli or granola. Also, fresh locally grown fruits in season, local dairy yogurts, fresh bread and a selection of preserves. We also offer a delicious vegetarian option. Relax in 3 acres of stunning grounds at our Bed and Breakfast, in our tastefully furnished country house, decorated in tranquil colours. The Bed and Breakfast is an ideal retreat from the rush of modern life. So much to see and do in the surrounding area. Rye town centre, harbour and nature reserve. Hastings with its old town, beach, seafood and amusements. Stream House Bed and Breakfast Rye is ideal for romantic breaks! “We had a lovely time staying with you, it was the perfect start to our honeymoon“. 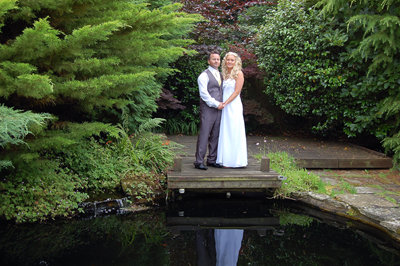 Following their wedding in Hastings, Natalie and John had this photo taken during their stay at Stream House. Short Breaks, Midweek and Weekend Breaks or longer at our B and B Rye. “Sandra and Steve are perfect hosts. Sandra’s attention to detail is to be admired. Her knowledge of local facilities is excellent. She identified several pubs within easy drive for our evening meals and all offered good quality food and atmosphere. Nothing was too much trouble for her. We run our own small, award-winning accommodation business in Tasmania and inevitably run a fine eye over places we stay at. Against this yardstick we have no qualms in absolutely recommending Stream House to all who want the perfect retreat and haven whilst travelling“. Stayed October 2016, travelled as a couple.